We stopped to get some photos and the settings were spectacular. This is my favorite shot of the wild styling of the front nose, with the Grabber Blue and the white racing stripes. I call it Petty Blue, but Ford calls it Grabber Blue. I didn't find the rear styling of the 2011 Shelby as exciting as the front and the only thing on the rear that stood out was the chrome letters that said SHELBY. More than one person did a double take on that name. 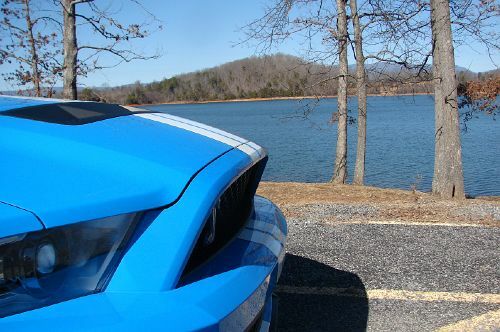 What more could you ask for than to have a new 2011 Shelby GT500 in the mountains, with a lovely lady, and the sun is shining. Everywhere is a beautiful view and you have a snarling beast at your beck and call. Life is good.